This gives my daughter Gladiola a brilliant idea. She can do her science project and save Mardi Gras at the same time. She goes on Google and informs me that since the beads they throw during Carnival are plastic, they don’t “biodegrade”— the new word for “rot” — and every single bead will be around until Judgment Day. Them and roaches. She says that a few people have already developed beads that will supposedly biodegrade, but hardly anybody throws them at parades. Probably the beads they order from China are cheaper. Huh. I bet the Chinese would make cheap beads that biodegrade, if everybody would buy them. But Gladiola don’t want to wait around for that. She is going to make her own biodegradable beads. She texts her science lab partner, Chlorette. They both remember, back in pre-school, stringing necklaces out of biodegradable stuff like macaroni and Cheerios and raisins. So they make one of each. And they use plastic Bacchus beads for a control sample. This is called the scientific method. So far, so good. But then they get the idea that, to scientifically duplicate conditions in a storm drain, with water washing through every once in a while, they should use a toilet. They need a toilet that nobody ever uses for normal purposes. And they got one — in the men’s room at Celibacy Academy. Since it is a all-girls’ school, nobody ever uses it except old Father Benisisus, who says Mass in the chapel only on special occasions. They twist a wire hanger into an oval, string the necklaces on it, sneak into the men’s room, and wedge it underneath the toilet seat. 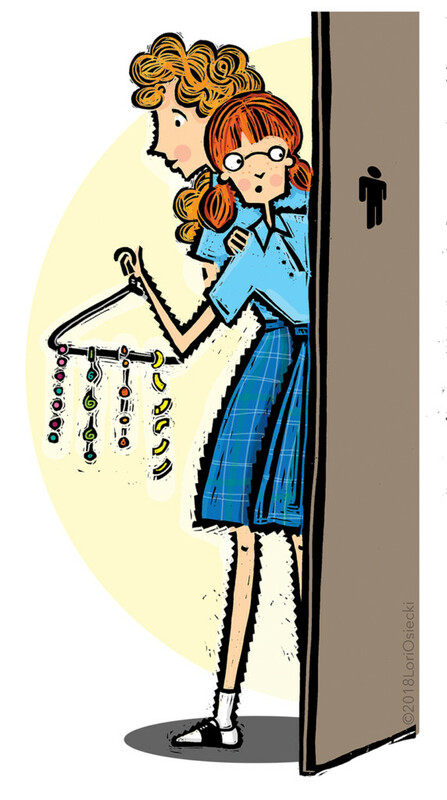 Twice a day, one girl guards the door while the other sneaks in, takes a picture of the various necklaces as they biodegrade, then flushes more water over them. They don’t tell me about this. They don’t tell the nuns, neither. One week before the project is due, Gladiola glances out the window during algebra class and sees Father Benisius hobbling up the walk. She realizes it’s Sister Gargantua’s birthday, which is a special occasion. And everybody know where Father goes before he does anything else. She asks to be excused and rushes to the men’s room. She pulls half the hangar out the toilet and then it straightens out and all the necklaces slither off and down the drain. So she flushes it. And the toilet overflows. She has the sense to turn off the valve underneath the toilet (because for once she remembers something I taught her) and beats it out of there. Father goes in, sees water all over the floor, comes out, sees Gladiola lurking there, and asks her to stand lookout while he uses the ladies’ room across the hall. She does, and tells him she will report the problem. Which she don’t. She figures the macaroni and stuff will dissolve eventually — that being the whole point of the experiment— but somebody is going to have to explain how Bacchus beads got in there. Turns out, Chlorette’s boyfriend, Snark, has a daddy who’s a plumber, and he got a special air gun that will blast anything out of a pipe. He shows them how to use it, and next morning, before classes, Chlorette watches at the door and Gladiola gets in there, jams that thing in the toilet and pulls the trigger. Then she hears “Boom!” Then a shriek. Because the bathroom for the retired nuns’ section is on the other side of that wall, and the pipe drains join together. Sister Mary Feeble had dropped her drawers but, thank God, hadn’t sat yet. Because their bathroom ceiling is covered with all kinds of mess, and it’s raining raisins and plastic beads. And after the nuns realize Feeble isn’t hallucinating again, they track down the culprits. So what happens, Chlorette and Gladiola win Most Original Effort at the science fair. Plus a two-day detention to be spent cleaning the ceiling. That’s why science don’t get nowhere.